This guide provides essential installation and getting started instructions to set up Red Hat Gluster Storage Web Administration for monitoring purposes. 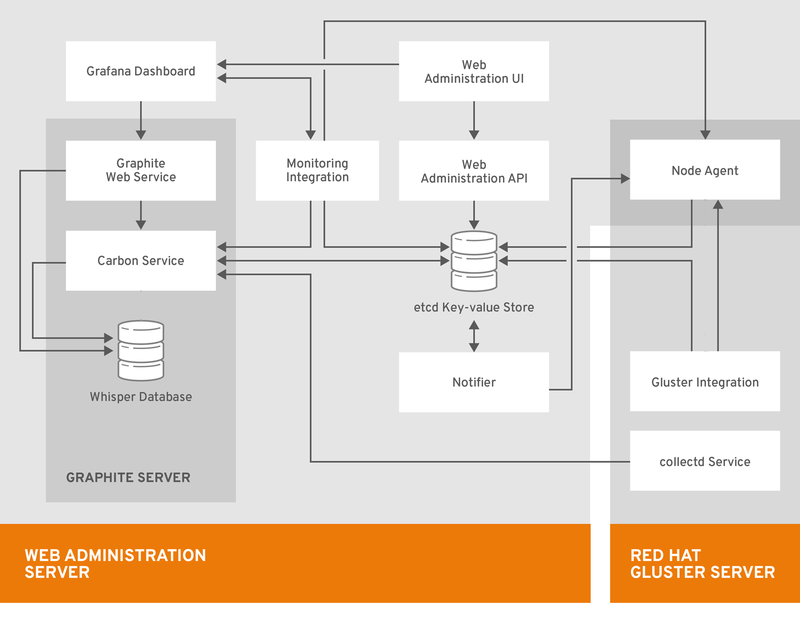 Red Hat Gluster Storage Web Administration provides monitoring and metrics infrastructure for Red Hat Gluster Storage 3.4.0 and is the primary method to monitor your Red Hat Gluster Storage environment. The Red Hat Gluster Storage Web Administration environment is based on the Tendrl upstream project and utilizes Ansible automation for installation. The key goal of Red Hat Gluster Storage Web Administration is to provide deep metrics and visualization of Red Hat Storage Gluster clusters and the associated storage elements such as storage nodes, volumes, and bricks. The Red Hat Gluster Storage Web Administration environment consists of the following system components. The Web Administration server system hosts the Web Administration user interface, the API and etcd. The Web Administration server is the system on which the Ansible installation process is run. The system on which Red Hat Gluster Storage is installed. Web Administration node agents are installed on the storage nodes. Any external system that accesses the Web Administration user interface on a compatible web browser. Web Administration UI: the primary user interface for monitoring Red Hat Gluster Storage clusters. Grafana Dashboard: a third party integrated dashboard that displays real-time metrics and monitoring data. Monitoring Integration: service that enables monitoring and alerting via integration with external systems such as Graphite and Grafana. Graphite Web Service: repository of (Gluster) telemetry data collected using collectd. Carbon Service: set of services dealing with receiving data from collectors (collectd), replication and sharding, and interfacing with Grafana. Whisper Database: database for storing time-series numeric metrics. Web Administration API: the Web Administration northbound API. collectd Service: host-based system statistics collection daemon that gathers metrics from various sources such as the operating system, applications, log files and devices, Red Hat Gluster Storage clusters, etc. Gluster Integration: component that fetches data from Red Hat Gluster Storage cluster to be sent to the Web Administration server. Node Agent: takes care of node-specific flows and tasks to be performed. This chapter outlines the minimum hardware and software requirements to install Red Hat Gluster Storage Web Administration. Ensure that all the requirements are met before the installation starts. Missing requirements can result in Red Hat Gluster Storage Web Administration environment not functioning as expected. On the system to be designated as the Web Administration server, verify that these recommended hardware and software requirements are met. For more information on how to prepare and mount the additional disks, see the Creating a Partition and Mounting a File System sections in the Red Hat Enterprise Linux Storage Administration Guide. Red Hat Gluster Storage Web Administration is supported on Red Hat Enterprise Linux 7.5 or later 64-bit version. Red Hat Enterprise Linux 7.5 or later. Red Hat Gluster Storage servers updated to the latest Red Hat Gluster Storage version 3.4 or greater. For detailed instructions on the upgrade process, see the Upgrading Red Hat Storage section in the Red Hat Gluster Storage Installation Guide. For more information, see the knowledge base article on Red Hat Gluster Storage Hardware Compatibility. For detailed information on prerequisites and setting up Red Hat Gluster Storage server, see the Red Hat Gluster Storage 3.4.0 Installation Guide. In this version of Red Hat Gluster Web Administration, firewall configuration is automated by Ansible automation. The tendrl-ansible installer configures the firewall during Web Administration installation as the variable *configure_firewalld_for_tendrl* is set to True by default. This automation opens all the required ports for the Web Administration environment. To automatically configure the firewall, follow the Web Administration installation process. See the Web Administration installation section in the Quick Start Guide for details. For tendrl-ansible to automate firewall setup, ensure the firewalld service is configured and enabled. For instructions, see Configuring Firewalld section in the Red Hat Enterprise Linux Security guide. Set the variable configure_firewalld_for_tendrl to False in the [all:vars] section of the inventory file which will be applied to both the groups: tendrl_server and gluster_servers. See sample variables described in Sample Inventory Variables at the end of 3.3 Web Administration Installation procedure of this guide. The inventory file is created as part of the Web Administration Ansible installation process. Follow 3.3 Web Administration Installation procedure of this guide. If you are updating to Web Administration 3.4 Update 2 or higher from previous versions, you no longer need to open TCP port 3000 on the Web Administration server. If you are updating to Web Administration 3.4 Update 3 or higher from previous versions, you no longer need to open TCP port 10080 on the Web Administration server. Access to Graphite-web TCP port 10080 is unencrypted, you can open it if required. To be able to execute the iptables commands successfully, ensure the iptables-services package is installed. To install the iptables-services package, run yum install iptables-services. This chapter covers installing Red Hat Gluster Web Administration using Ansible automation. Set up SSH password-less connection from the Web Administration server system to the remote Gluster servers in addition to localhost (SSH to localhost). For information on how to set up SSH key-based authentication, see the Using Key-based Authentication section in the Red Hat Enterprise Linux System Administrator’s Guide. To install Web Administration, follow the sequence outlined below. For detailed instructions to execute the following sequence, see the next section entitled 3.3. Web Administration Installation of this Guide. Installing the latest version of Ansible and tendrl-ansible on the Web Administration server. Creating inventory file with required groups: tendrl_server and gluster_servers with mandatory and optional ansible variables. Executing the site.yml playbook and accessing the Web Administration environment. tendrl_server: contains one machine acting as Web Administration server. gluster_servers: contains all the Red Hat Gluster Storage nodes. tendrl-ansible.tendrl-server: contains tasks for Web Administration server belonging to the tendrl_server group in the inventory file. tendrl-ansible.tendrl-storage-node: contains tasks for Red Hat Gluster Storage nodes belonging to the gluster_servers group in the inventory file. The following procedure outlines the steps to install Web Administration the Ansible way. Verify that the latest Ansible package is obtained from the rhel-7-server-ansible-2-rpms channel before executing the following steps. Additionally, ensure that the Ansible version is the same on the Web Administration server as available on the storage nodes. Latest version of Web Administration is compatible with the latest version of Ansible. Web Administration is not compatible with versions below Ansible 2.5. For instructions on setting up an inventory file, see Ansible Inventory file setup in Ansible documentation. For more detail, see the Sample Inventory variables at the end of this installation workflow. Add any other optional variables in the inventory file as required. The other variables are listed in the Ansible roles README files at the following paths. Enable or disable features by specifying values to the variables such as etcd-tls client authentication. For detailed TLS configuration instructions, see Chapter 5. TLS Encryption Configuration of this Guide. The firewall configuration variable is enabled by default. Copy the site.yml playbook into the working directory where the inventory file is stored. Ansible should return SUCCESS and pong message for all the nodes as shown in the example above. Do not proceed until the SSH connection is successfully established. If there are any missing requirements, the prechecks playbook will detect it immediately, and direct your attention to the specific problem before running the installation. Log in to the Web Administration environment. For login instructions, see the Web Administration Login chapter of this guide. 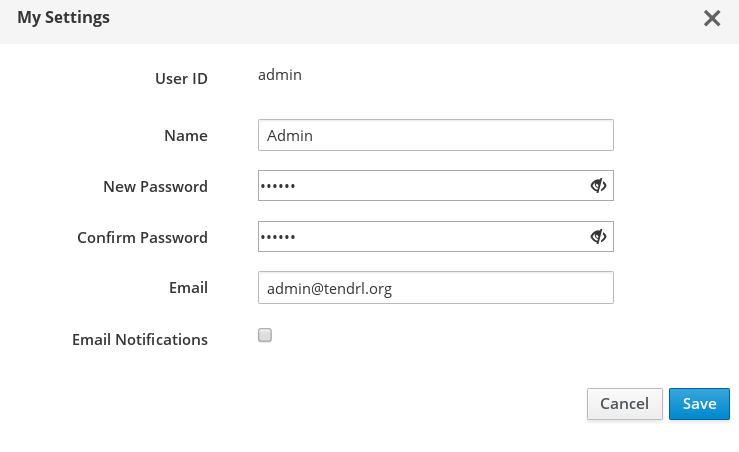 The tendrl-ansible.tendrl-server role creates the default user as admin and default password as adminuser. The default password is stored in the /root/password file of the Web Administration server. tendrl.example.com hostname is translated to IP address 192.0.2.1. See the full description in the README file of tendrl-ansible.tendrl-server role and pay attention to the values you specify there when you use multiple network interfaces on the machines. You can define these variables in variable files or from the command line directly, but including them into the inventory file provides you with a single file with a full description of tendrl-ansible setup for future reference. The consolidated variables in the inventory file can be used for the cluster expansion process and also to ensure the installation configuration is intact. The inventory file does not contain the grafana admin password which is stored in the grafana_admin_passwd file generated during tendrl-ansible execution. This chapter describes the procedure to upgrade Web Administration to version 3.4.0 from previous versions. Stop and disable all Web Administration services on storage nodes. Enable the Ansible repository and ensure the other required repositories are enabled. Upgrade Red Hat Gluster Storage to version 3.4.0. Reinstall Red Hat Enterprise Linux on the Web Administration Server. Import the Gluster 3.4.0 cluster. Stop and disable the following services on the storage nodes by executing the commands given below. The tendrl-node-agent service is enabled and started during execution of the tendrl-ansible site.yml playbook. The collectd and tendrl-gluster-integration services are enabled and started after importing a cluster into the Web Administration environment. To check the required repositories, see the Prerequisites section of the Quick Start Guide. After enabling the required repositories, upgrade your Red Hat Gluster Storage environment to 3.4. For detailed upgrade instructions, see the Upgrading to Red Hat Gluster Storage 3.4 chapter in the Red Hat Gluster Storage 3.4 Installation Guide. After a successful upgrade, resume the following steps. Reinstalling Red Hat Enterprise Linux on the Web Administration Server After upgrading Red Hat Gluster Storage, reinstall Red Hat Enterprise Linux on the host system. For detailed installation instructions, see the Red Hat Enterprise Linux Installation Guide. After reinstalling Red Hat Enterprise Linux, install Web Administration and its associated components on the Web Administration server and the Gluster Storage servers using tendrl-ansible. The Web Administration components already installed on the Gluster Storage servers will be reconfigured for the new installation. For detailed instructions on installation, see Chapter 3. Installing Web Administration, the preceding chapter of this Guide. After installation, import the Gluster 3.4 cluster in the Web Administration environment. For detailed import procedure, see the Import Cluster chapter of the Web Administration 3.4 Monitoring Guide. This chapter describes the procedure to update Web Administration from version 3.4.x to 3.4.y. The Web Administration update path outlined here is part of the overall Red Hat Gluster Storage offline update. Updating Web Administration as a standalone component is not supported. Execute the Web Administration update procedure as per the update sequence outlined in the 7.2. Updating Red Hat Gluster Storage in the Offline Mode section of the Red Hat Gluster Storage Installation Guide. To update your Web Administration environment to version 3.4.y, follow the steps outlined below. Stop all Web Administration services. Follow the steps from 1 - 9 under the heading Updating Red Hat Gluster Storage 3.4 in the offline mode in the 7.2. Updating Red Hat Gluster Storage in the Offline Mode section of the Red Hat Gluster Storage Installation Guide. After executing all the steps from step 1 to step 9 under 7.2. Updating Red Hat Gluster Storage in the Offline Mode, return to this section and continue with the following steps. Run the tendrl-ansible playbooks with the same initial installation configuration. For instructions, see section 3.3. Web Administration Installation, steps 2 to 9. After successful completion of all the steps, your Red Hat Gluster Storage and Web Administration environment should be updated to the latest version. It is required to clear your web browser cache data after the Web Administration Update process is complete. This action is to ensure all the new changes featured in the new version are reflected in the updated Web Administration environment. You need to have Certificate Authority (CA) to be able to generate and sign certificates. The CA can be either self-signed or a trusted CA. For instructions about generating a CA certificate, see the Creating Your Own Certificates section of the Red Hat AMQ Security Guide. CA is used to sign certificates for the storage nodes and Web Administration server for TLS-based client server etcd authentication. CA is also used to sign the certificate that is used for the https setup on Web Administration server. However, CA for TLS etcd setup can be different from CA for https setup. Red Hat Gluster Storage Web Administration or tendrl-ansible neither generates nor deploys certificate files or keys. Red Hat Gluster Storage Web Administration supports etcd’s TLS-based security model. This model supports authentication and encryption of traffic between etcd and Web Administration system components. By default, etcd functions without authentication and encryption but it is recommended to use TLS authentication for client-server encryption. Before setting up the TLS encryption, ensure that the general prerequisites are met. See Section 5.1, “General Prerequisites”. Generate a private key and a client certificate for each storage node and the Web Administration server. For more information, see the Creating and Managing Encryption Keys section of the Red Hat Enterprise Linux Security Guide. On each Web Administration managed storage node, and on the Web Administration server, place the PEM-encoded private key and the client/CA certificates in a secure place that is only accessible by the Web Administration server’s root user. Configuration of TLS encryption for etcd is automated using tendrl-ansible. Hence, you need to have tendrl-ansible installed and the inventory file created. See Chapter 3, Installing Web Administration chapter. Configuration of TLS encryption for etcd is performed either during the installation of Web Administration (when tendrl-ansible is run for the first time) or later by rerunning tendrl-ansible. After generating and placing the TLS certificate files in the preferred directory, update the value of the Ansible variables in the inventory file with the respective file paths of the certificate files. Add and modify the following etcd TLS variables in the [all:vars] section of the inventory file. Variable used to enable or disable TLS authentication. Certificate used for SSL/TLS connections to etcd. When this option is turned on, advertise-client-urls can use the HTTPS schema. Key for the certificate that has to be unencrypted. Set the value for etcd_tls_client_auth variable to True. By default, the value of this variable is False. Edit the file path for the etcd_cert_file variable as required. The default value is /etc/pki/tls/certs/etcd.crt. Edit the file path for etcd_key_file variable as required. The default value is /etc/pki/tls/private/etcd.key. Edit the file path for the etcd_trusted_ca_file variable. The default value is /etc/pki/tls/certs/ca-etcd.crt. Continue the Web Administration installation process by following the Web Administration Installation chapter. This section describes how to set up SSL access for Web Aadministration UI, REST API, and Grafana based dashboard. Web Administration UI, API and Grafana dashboard, which are provided by the apache server, are secured with SSL by reconfiguration of apache. Access to unencrypted http port is redirected to encrypted https port. Web Administration contains sample configuration files for the apache to simplify the SSL setup. mod_ssl package must be installed and the default configuration in /etc/httpd/conf.d/ssl.conf must be left unmodified. SSL key and certificate files need to be deployed on the Web Administration server. See Section 5.1, “General Prerequisites”. Enabling HTTPS for Web Administration components must be done after the Web Administration installation. 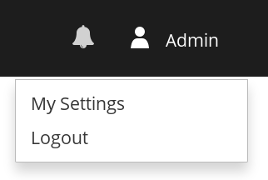 Access to Grafana dashboard is not authenticated, which means that anyone who has access to Web Administration login page can access and read all panels in the dashboard without any password. They also can learn about the cluster structure, current workload, and historic trends. This is because Web Administration uses anonymous access to Grafana dashboard. Web Administration server listens on a few ports that are not secured but needed for internal communication. For example, Web Administration server receives metrics data from storage machines. Nothing else is secured or restricted compared to the default setup without HTTPS enabled. On a machine where Web Administration server is installed, perform the following steps. Set ServerName to host name (fqdn) of Web Administration server. Edit the file path for the SSLCertificateFile variable if you want to use your own certificate instead of default self-signed /etc/pki/tls/certs/localhost.crt generated by the mod_ssl package. Edit the file path for the SSLCertificateKeyFile variable if you have changed certificate file in the previous step. The default value is /etc/pki/tls/private/localhost.key. Uncomment the line which has the Redirect rule and replace %ssl_virtualhost_fqdn% with the fully qualified domain name of Web Administration server. Comment the lines (put a # at the beginning of each line) that have the DocumentRoot, ProxyPass, and ProxyPassReverse directives. Ensure that the https port is open. Reload the web browser if you have the browser open with the Web Administration UI or Grafana dashboard. The Web Administration interface is accessed on a client system using a compatible web browser. Open the following URL in a web browser. Replace web-admin-server.example.com with the hostname or FQDN of the Web Administration server. The login page is displayed. Enter the default username admin and the default password adminuser, and click Log in. The Clusters interface is displayed after logging in to the Web Administration interface. This interface is the starting point to initiate a cluster import. For instructions on how to import a Gluster cluster, see the import cluster chapter in the Red Hat Gluster Storage Web Administration Monitoring Guide. After logging in to the Web Administration interface, all the managed and unmanaged clusters are displayed in a rows format with the corresponding cluster attributes. To identify the version of Red Hat Gluster Storage installed, see the Cluster Version attribute. Managed cluster are the clusters that are successfully imported by Web administration for monitoring purposes. Unmanaged clusters are the clusters that are ready to be imported by Web Administration. Mixed cluster attribute signifies a cluster containing at least one volume with profiling enabled and at least one with profiling disabled. To identify managed and unmanaged clusters, view the cluster attributes. Unmanaged Cluster: An unmanaged cluster displays the Managed attribute as No. Managed Cluster: A managed cluster displays the Managed attribute as Yes. The Clusters tab provides a shortcut button to access the Grafana Monitoring Dashboard. At the right hand side of a cluster row, click on Dashboard and you will be redirected to the Grafana Monitoring dashboard. The Web Administration interface provides a menu to select and switch interface views displaying a common clusters interface and a cluster-specific interface. At the top left of the default landing page, next to the label Red Hat Gluster Storage Web Administration, a drop-down menu is available. All Clusters view: the default selection after logging in that displays all managed and unmanaged clusters. Cluster-specific view: option to select a specific managed cluster. To select a cluster-specific Interface, click on the down-down menu and select the specific managed cluster. The cluster-specific interface is displayed with a left navigation pane for Hosts, Volumes, Tasks, and Events associated with the selected cluster. To switch back to the default landing interface view displaying all clusters, select All Clusters from the drop-down menu. The cluster-specific interface provides a vertical navigation pane available at the left hand side of the interface to conveniently access the different elements of the clusters. The Clusters tab in the navigation pane lists all the imported clusters in a rows format. 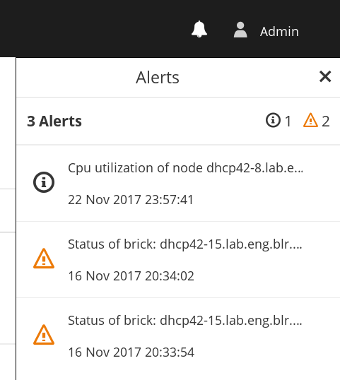 Each row shows the individual cluster attributes such as the version of the cluster, whether managed or unmanaged and the status of Volume Profiling whether enabled or disabled. 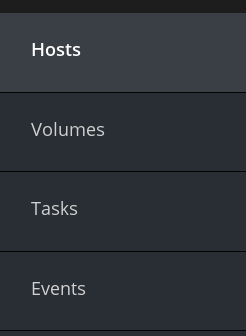 The Hosts tab in the navigation pane lists all the accepted hosts assigned to different clusters. The Hosts can be filtered by the Host Name or Status. The Hosts tab provides a shortcut button to access the Grafana Monitoring Dashboard. At the right hand side of a Host row, click on Dashboard, and you will be redirected to the Grafana Monitoring dashboard. The Events view lists all the events occurred in the system. To view more detail of a specific event: copy the task ID or the job ID if available in the event listing to the task ID filter of the Tasks view interface. The Web Administration consists of a sizeable number of user-initiated actions to accomplish operations such as importing clusters. It is crucial for Web Administration users to monitor and view the status of the actions they initiated. Tasks can filtered by Task ID, Task name, the status of the task and the time interval. The Task details will remain in the Web Administration interface for not more than the default Time to live (TTL) of 2 days. Once the timespan has elapsed, the task details will be discarded from the system. The Users tab lists all the users created to access the Web Administration interface. The interface provides user tasks such as adding, editing and deleting a user. For more user administration actions, see the Users and Roles Administration chapter of the Red Hat Gluster Storage Web Administration Monitoring Guide. To view system-wide notifications and to change the user password, a menubar is available at the top right corner of the interface. To view system-wide alerts, click on the bell icon at the top right menubar of the interface. Click on the user icon from the menu bar. A dialog window is opened. Enter the new password twice and click Save. Email notifications are disabled by default. To enable, check the Email Notifications box. For email notifications configuration instructions, see the SMTP Notifications Configuration section of the Red Hat Gluster Storage Web Administration Monitoring Guide.